Illusionist Shows - Magic Unlimited! Las Vegas Style Illusionist Shows! The biggest shows in Las Vegas are illusionist shows – and for good reason – people love to see the impossible happen right before their very eyes. Seeing someone appear, disappear, levitate or get sawn in half is interesting on TV, but seeing it live on stage is an experience you’ll never forget. You know it’s not a camera trick – but there’s no other explanation. Your guests will be talking about these illusionist shows for years. So take a step up from a Stage Magic Show into the realm of Grand Illusions. We can provide you with the perfect illusionist to make your next event unforgettable. Where is the best place for an Illusionist Show? ‘The Australian Institute of Magic’ is the only magic industry body in Australia set up to resolve any disputes between performers and clients. Thankfully, due to their extremely high standards of ethics, this service still remains unused. 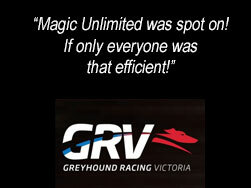 All of our magicians have Public Liability cover to the value of $20 million. In the unlikely event of any mishap, you can be assured you will be looked after professionally and efficiently. All of our performers have current Working with Children’s checks and present shows which can be performed in front of any audience without offending a single person. Photos are generally fine, as long as the photographer doesn’t block the view of any audience members. However videotaping the show often constitutes a breach of copyright and will require the permission of the performer in advance. Make sure that you discuss this with the performer, before you make the booking. Some unethical Australian Magicians have decided to make up awards to encourage people to book them. Titles like ‘Magician of the Year’ are fictitious. All awards listed by our magicians are 100% legitimate and well deserved. 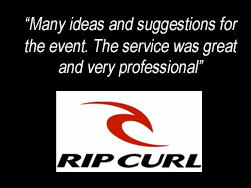 All of our performers have a vast collection of comments satisfied customers. Feel free to ask them for more, and you can add your own in the comments section of each performers listing as well! 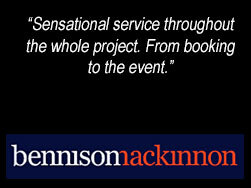 All of the performers are happy to adapt their shows to suit your needs. They can change the length, create special tricks, add features like making your CEO appear, incorporating a product or message, adding an illusion or dancers, and even performing close up magic before or after the show. Whatever your request, no matter how odd, feel free to ask. It may cost extra, but you’re guaranteed to get exactly what you want. When you book your entertainer through Magic Unlimited you will usually need to pay a small deposit to guarantee your booking. This can be made by direct deposit, cheque or credit card via PayPal. 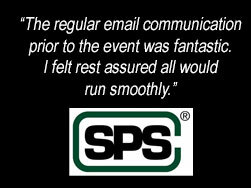 This guarantees the performer you selected (we don’t substitute performers) will attend your event. 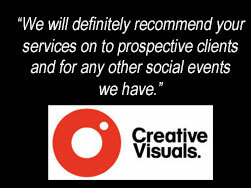 We also guarantee customer satisfaction. 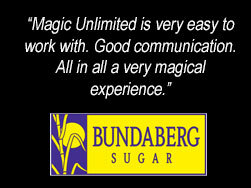 At Magic Unlimited our reputation is our most valuable asset, and that’s based on 30 years of extremely satisfied customers.